Review sample provided by BlueFin. 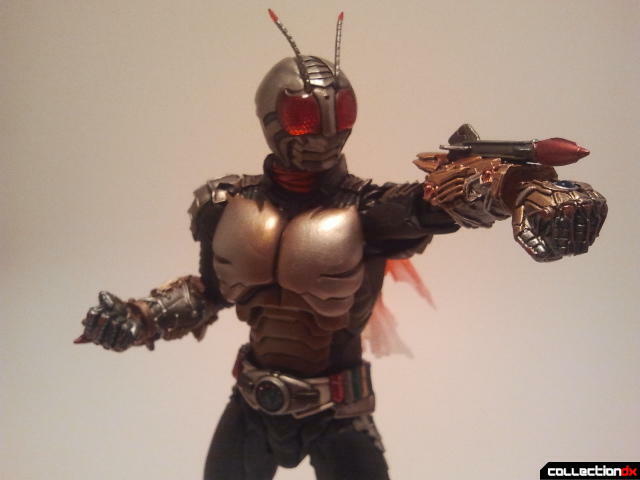 I haven't watched a whole lot of the Showa Kamen Rider shows yet, but I do love a lot of their designs. 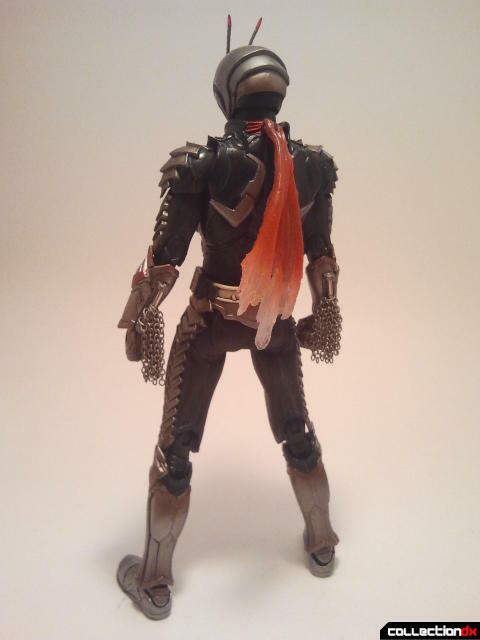 My favorite Showa design in particular is Kamen Rider Super 1. The first thing that I ever learned about Super 1 was from our very own VF5SS, who basically told me that Super 1 is an astronaut who knows kung fu. I was sold on Super 1 from there on. Super 1 has one of the cleanest and most streamlined suits from the Heisei era. The sleek silver and black color scheme makes Super 1 easily recognizable in a sea of red, green, and other brightly colored Riders. 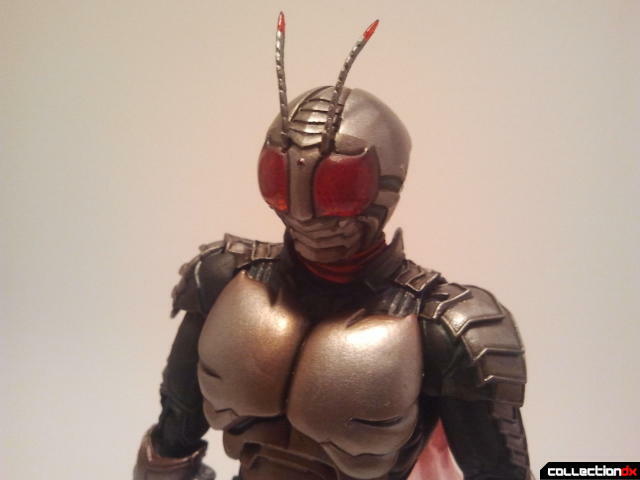 In the traditional SIC style, Super 1 takes some of the base ideas of a space Kamen Rider and stylizes it to several extremes. 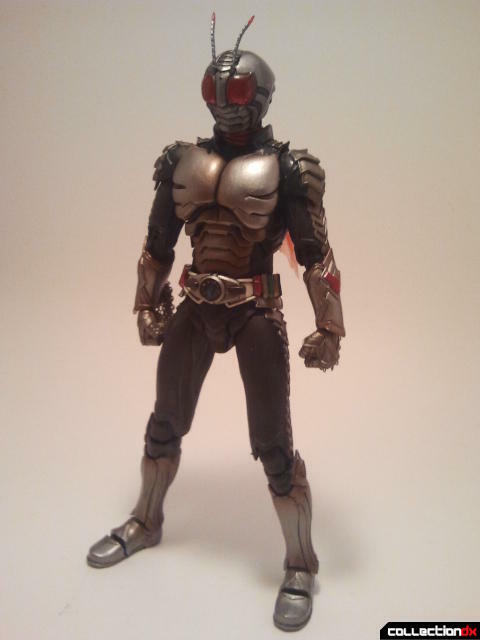 For starters, the once shining silver parts that cover Super 1 have now been worn down and rusted. Super 1 has a rather interesting base body underneath as well. 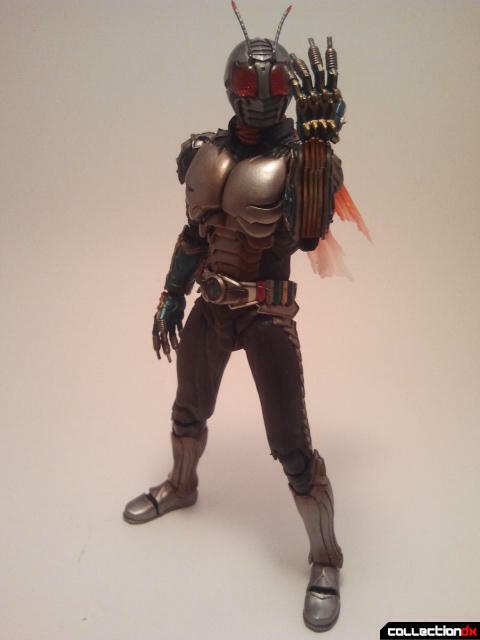 It looks like he's actually wearing a leather jacket if you look at his neck, and reminds me of the designs from the Kamen Rider The First and The Next movies. 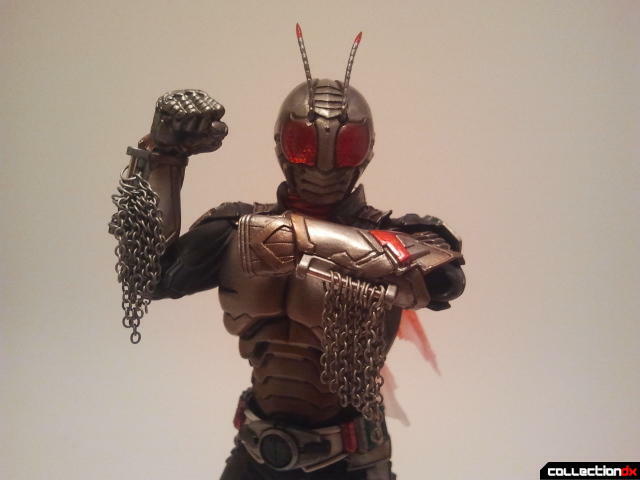 The tassels that were once on Super 1's gloves have been turned into metal chains. A very neat and interesting take on the Super 1 design. Unfortunately, since these are just tiny metal chains, they do tend to bunch up due to gravity at times and sometimes look a little bit off. Super 1's clean design leaves most articulation free with little impeding motion. The only major lacking area seems to be his torso, which is solidly locked in place because of his bulky chest plate, which is a bit of a shame. The scarf is also on a hinged peg, so you can have it flowing whichever way you please. 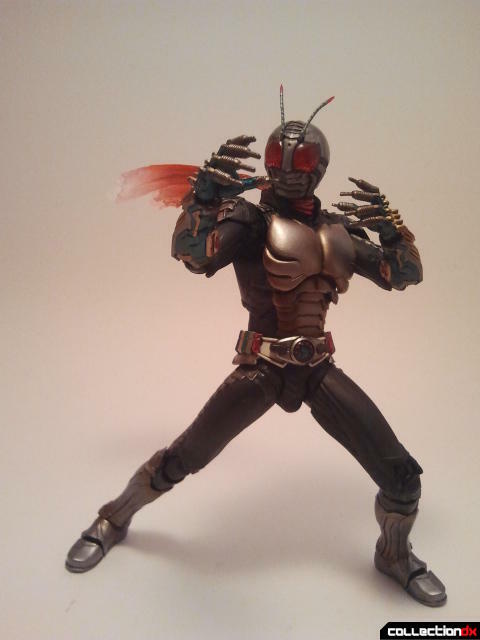 His feet in particular are very free and able to get very deep ankle tilts. So deep, in fact, that they go further than the hip joints can even accommodate, one of the most limiting factors of most SIC toys. Unfortunately, although the ankle joints provide a very wide range of motion, they are also slightly loose, leaving most extreme poses rather difficult to do without having Super 1 slip and fall. One of Super 1's main gimmicks are his Five Hands: a set of alternate gloves that give Super 1 an array of super powers and abilities. Although Super 1 by himself is a relatively conservative SIC design, the alternate gloves that he comes with are where the designers went a little nuts with what you can do with these designs. 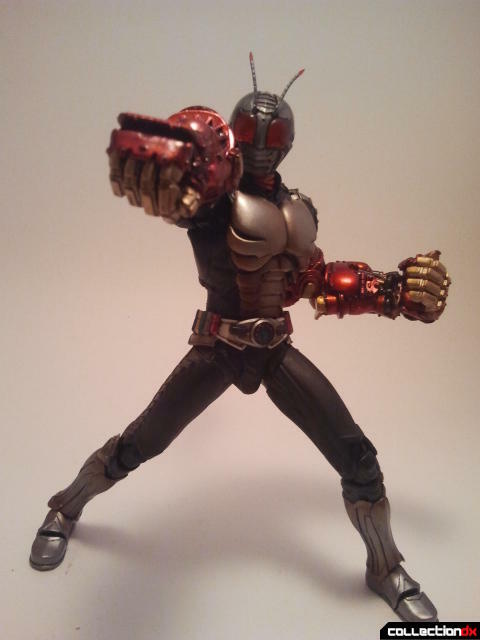 Swapping the hands is easy enough, just unpeg the arm at the elbow joint and swap with the arms of your choice. 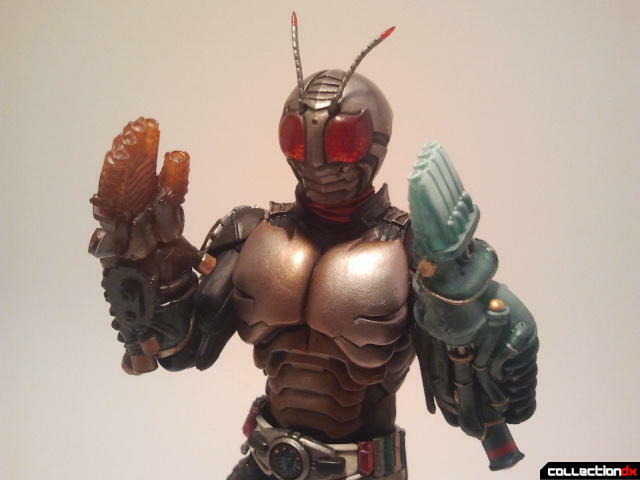 The first pair of alternate hands are the Hot and Cold Hands, which give Super 1 the power of Hot and Cold. Both of these hands are cast in clear plastic and have been painted over. There is an amazing layer of paint that has been “frosted” on top to make it look like these hands are literally glowing with Hot and Cold energy. The Radar Hands are used to shoot off rockets that help Super 1 see further using radar waves. I think that's kind of lame and I'm going to just pretend that Super 1 has wrist-mounted rockets because he's a kung fu astronaut and call it a day. These gloves are extremely detailed and the metallic finish on them gives off a very nice gleam in the light. 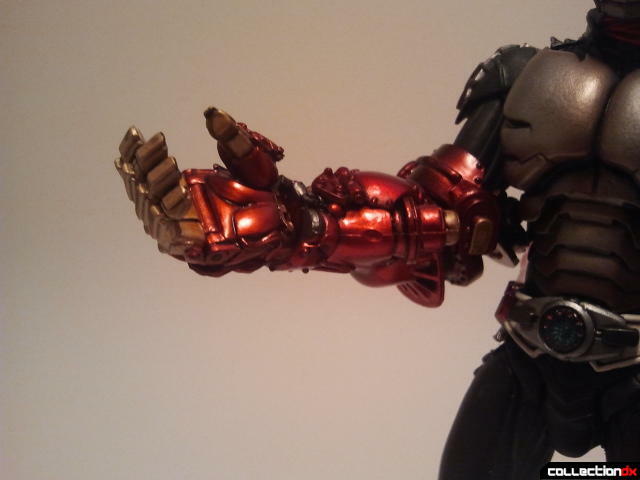 The rocket pieces are separate and peg right into the forearm with ease. My favorite pair of hands are the Elek Hands. Done in a truly electric blue, the Elek Hands can shoot off electricity. The Elek Hands look incredibly mechanical, like experimental weapons that Super 1 may not entirely understand. 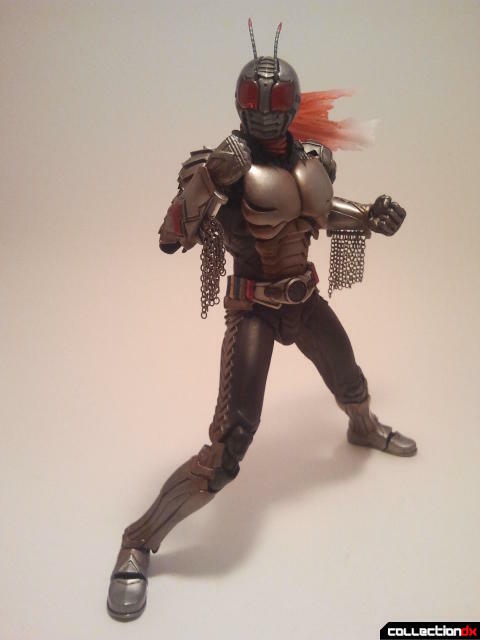 The metal plates on the forearms are actually diecast and add a bit of heft to these particular arms. I especially love how each finger has a series of coils around them. The final and largest set of hands are the Power Hands. A large pair of arms that are so huge that they are actually two-piece assemblies. 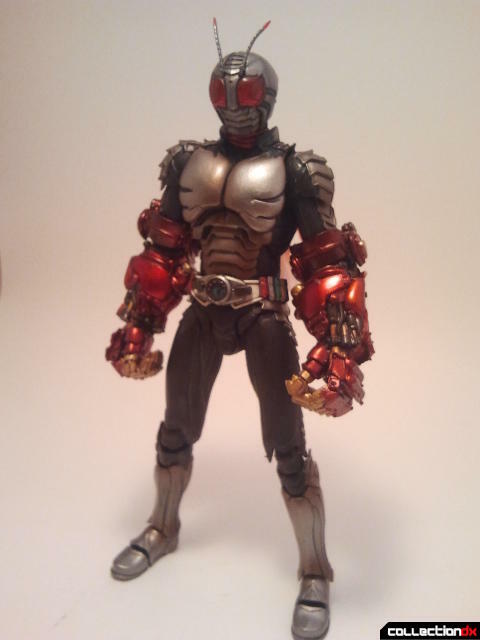 These hands are done in a very nice metallic red that pops right out. The thumb and fingers are actually slightly articulated as well, a nice if superfluous addition, since most of Super 1's posing with these is going to be him punching things. 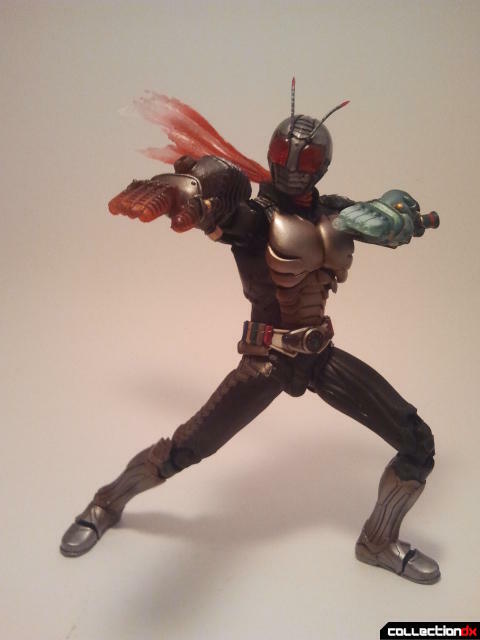 Although SIC Super 1 may seem like a pretty conservative redesign much like his predecessor, Skyrider, his accessories show off the more whacky and stylized part of SIC that I'm so fond of. 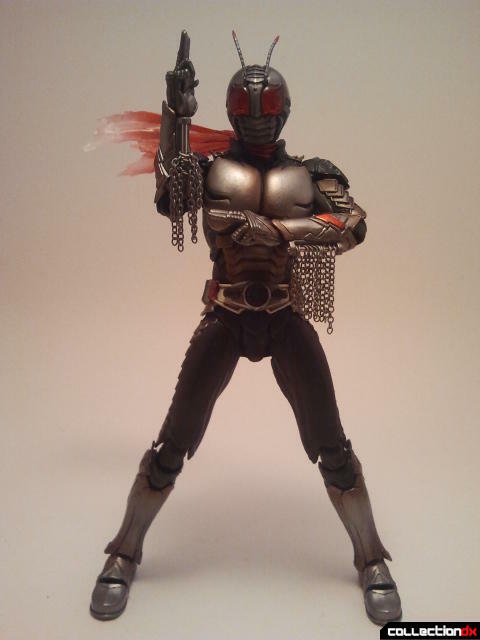 Super 1 is a rather simple SIC release, much like the other Showa Riders, and I think that is to his strength. Even without his accessories, Super 1 is a very posable and enjoyable release in the SIC line. Having his alternate hands on top of that is just icing on that cake. If kung fu astronauts are your thing, Super 1 is right up your alley. Review sample provided by Blue Fin. 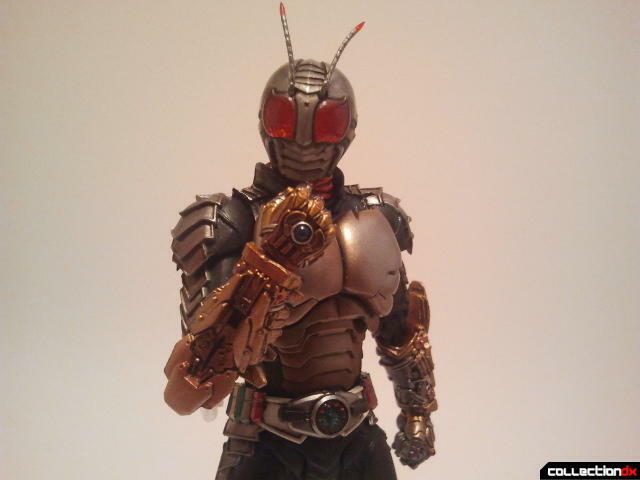 You can get your SIC Super 1 at BigBadToyStore! They certainly make the figure for me! Neat! 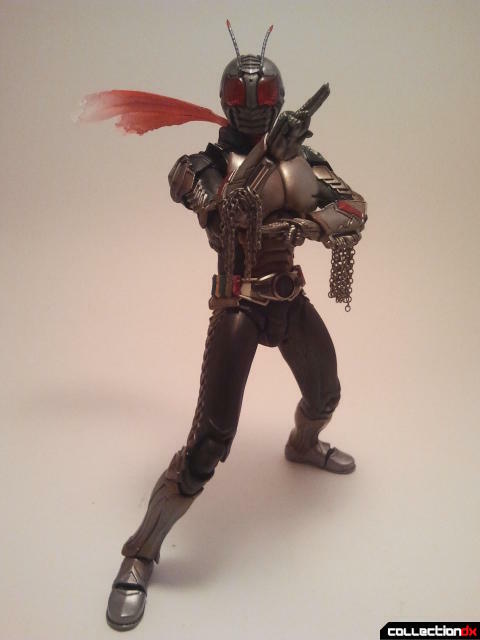 I thought that Kamen Rider Meteor from Fourze was the first to combine kung fu with a space theme. I learned something new! Monsters of Dogma/Jin-dogma were also awesome! Design work in Sky Rider was just simple, but the creature-design in Super1 was somehow different! 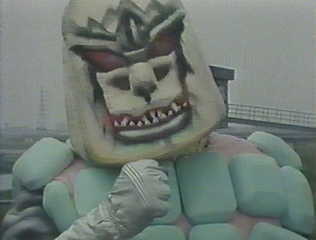 "Shabo-nurun", a creature of soap? "If kung fu astronauts are your thing..."
Wait, you mean they aren't everyone's thing? !